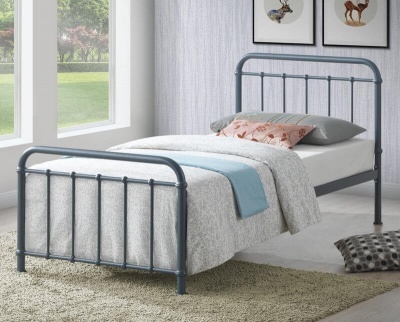 Beautiful single bed frame with a modern country house design. Narrow slats to the headboard, detailing to the legs and chunky head and foot-end tops add to the appeal. Choose from grey with oak top or cream with oak to suit your bedroom. A great choice for children's, teenagers or guest rooms. High build quality. Constructed from solid hardwood. The tops of the head and foot-end are made with veneers and have solid oak edges.